Hundreds of four-legged friends arrive at Boerne Animal Care Services every month. Some are only there for a short time before being returned to their owners. Others, however, wait days, weeks, and even months for the opportunity to be adopted into a forever home. That’s why from October 1st through the 31st Lockaway Storage in Boerne, Texas will be hosting a pet food and supply drive! Being able to provide nutritious food, fun toys, and clean facilities to the pets that are at the facility is something that is only made possible because of generous donations from the community. Jake Medrano, facility manager at Lockaway Storage in Boerne, Texas, said that they will be accepting dog and cat food, cat litter, any other pet supplies, and cash donations. While all of the Lockaway Storage facilities find ways to give back to the communities they do business in, Jake had a personal reason for wanting to dedicate his facility to helping out the local animal shelter. It’s not hard to get behind a cause that supports some of the most vulnerable, and adorable, members of the community. It makes sense that an individual like Jake has made this his passion project. However, Jake had a great answer for those wondering why a storage facility is helping out the local animal shelter. “It’s one of our core values here, give back and strengthen our community. That’s something that I want people to know. We’re not just here to store your belongings, we’re also here to be a pillar in the community,” Jake said. 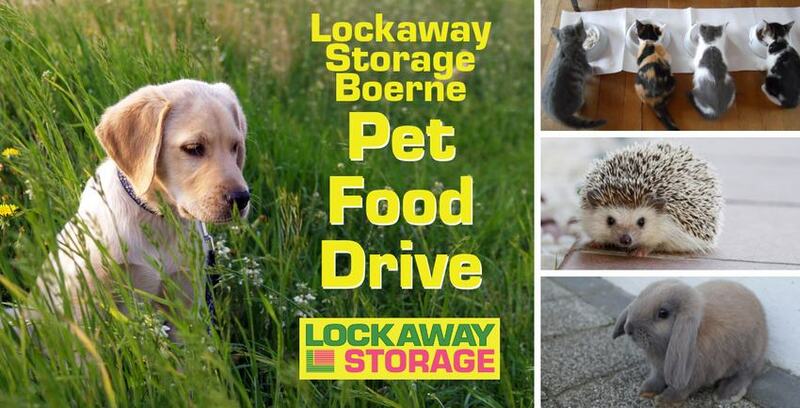 Lockaway Storage in Boerne on Interstate 10 has also partnered with three local pet supply stores where anyone can drop off donations for the drive. Donations can be made at the office during office hours which are Monday through Friday, 9:30 a.m. - 6:00 p.m., and Saturday 8:00 a.m. - 4:30 p.m. We are so excited to make this one of our best fundraising events yet and hope all of our customers will participate and encourage their friends and families to donate as well.